When Triumph ask me to make a lot of smoke then mono out of the smoke, who was I to argue… How I suffer for my art…. TIC. Just illustrating that traction control is switchable.. Many motorcycle manufacturers are riding the retro boom right now but none are doing it better than Triumph with their burgeoning Bonneville based range. 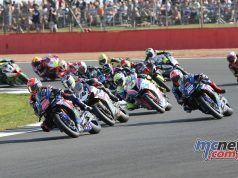 Word is that Triumph spent more time and money developing this new range than any other model line-up in their history. It shows. Our most recent extended sojourn was aboard the most gorgeous of them all, the exquisite, but purposeful, Triumph Thruxton and Thruxton R.
It is a beautiful thing, particularly with the optional ‘Track Racer’ kit which adds a colour matched nose fairing, that, along with a few other odds and sods, makes the Thruxton even more pukka retro. The larger new engine has 62 per cent more torque than its predecessor, and boy does it feel it. 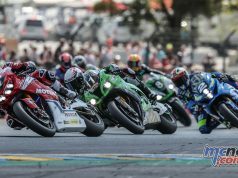 It is also significantly better endowed in the trousers department than the recently released T120, whose single-cam, eight-valve 1200cc engine it shares. An extra 17hp is liberated over the T120 thanks to a higher compression ratio, along with more free flowing exhaust and intake systems. It also spins up a little quicker via a lighter crankshaft. Around town, or when using the torque of the engine to lug a tall gear out of a tight corner, the charismatic beat is still there to be enjoyed and plenty of crank weight felt. It is not as if the entire character of the engine has had some sort of quantum shift in comparison to the T120. 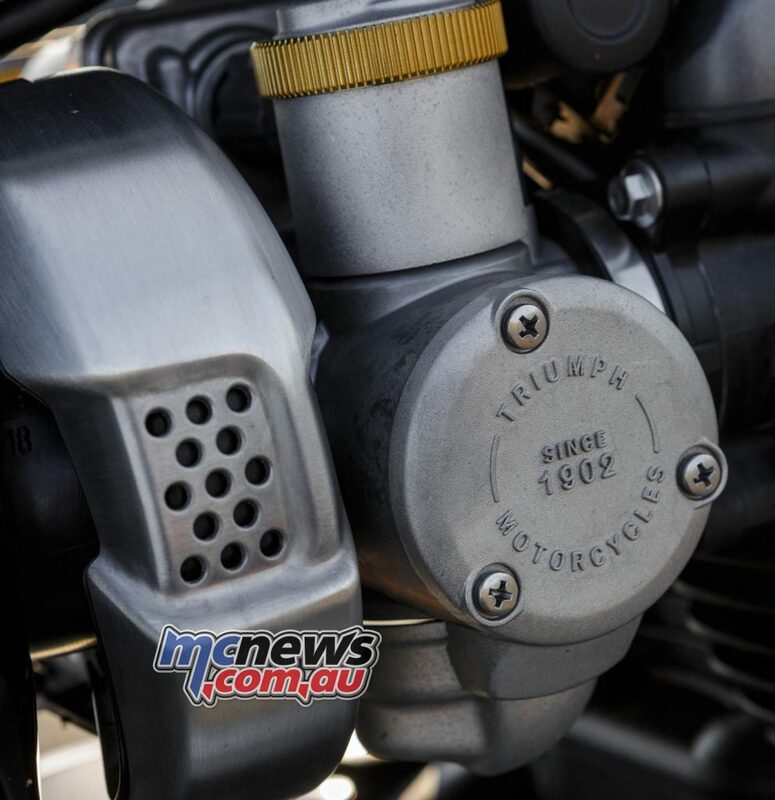 However, the new generation Bonneville models do provide a totally different feel in comparison to the previous generation 360-degree crank throw 865cc engine. The extra punch over the T120 is predominantly felt when cracking the throttle on, out of low to medium speed corners, where you can really feel the weight transfer to the back of the machine as the viscid 160/60ZR17 Pirelli Diablo Rosso Corsa digs in and drives the 203kg forward from the apex in a lusty fashion. The maximum claimed power of 96hp arrives at 6750pm, 200rpm higher than the 79hp of the T120. The Thruxton also makes more torque, its 112Nm max peaking at 4950rpm compared to the 105Nm of the T120 which arrives at a lowly 3100rpm. The Thruxton has more than 90 per cent of its maximum torque by 2500rpm, and doesn’t really start signing off until almost 7000rpm. Overtaking thrust in top gear from 100km/h is quite satisfying. The 270-degree parallel twin lunges forward when the throttle is picked up from a turn, it’s smooth and not in any way jerky or unwanted, it is instead, an eminently satisfying character trait that helps endear itself yet further. The take up on the slip-assist clutch I always found a little strange from standstill but once up and running the clutch and gearbox action is fuss free and I never missed a shift. Despite offering that massive amount of extra grunt over the previous smaller engined Thruxton model, the new donk also delivers improvements in fuel economy. Touring runs at triple digit highway speeds saw me achieve a best figure of 4.4 litres per 100km during a 255km jaunt from Ararat to the BP at Wallan, suggesting an ultimate range from the 14.5-litre fuel cell of almost 300km. Fanging in the hills will, of course, bring that number back to less than 250km. A tasteful fuel cap cover hides a lockable fuel cap beneath it. Further real world improvements over the T120 show up in the chassis department. 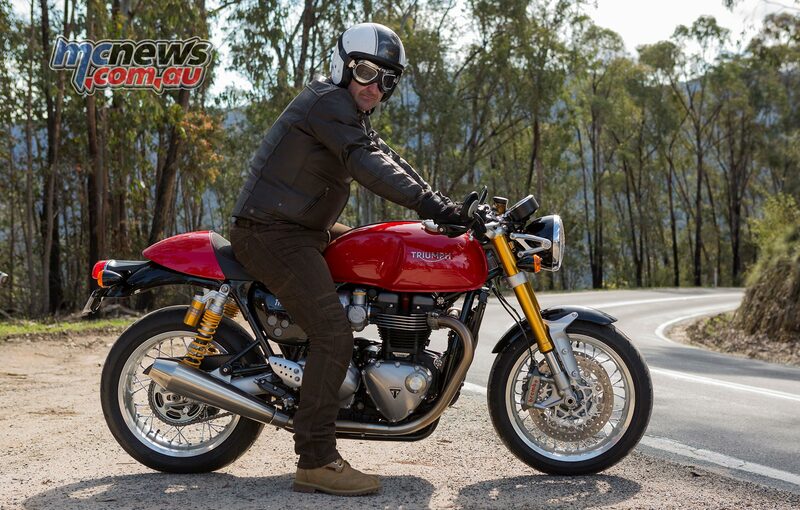 The T120 is certainly no wallower or unenjoyable ride in the twisties, but the Thruxton machines certainly up the ante further in the sporting stakes. 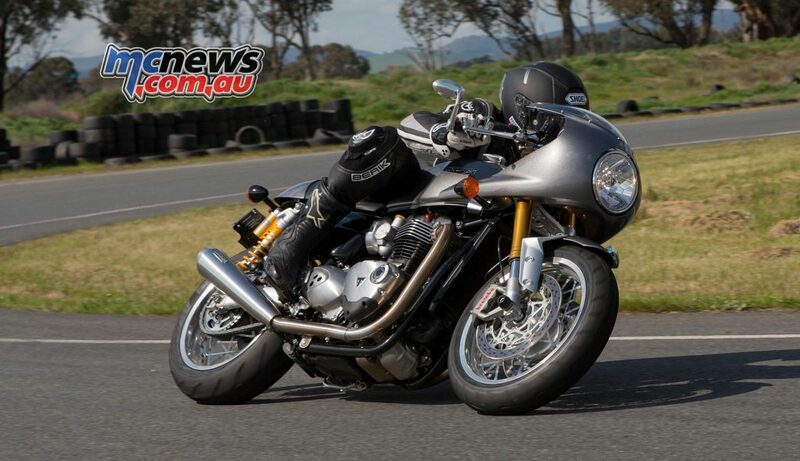 The base model Thruxton has reasonable KYB suspension, albeit adjustable only for rear preload. 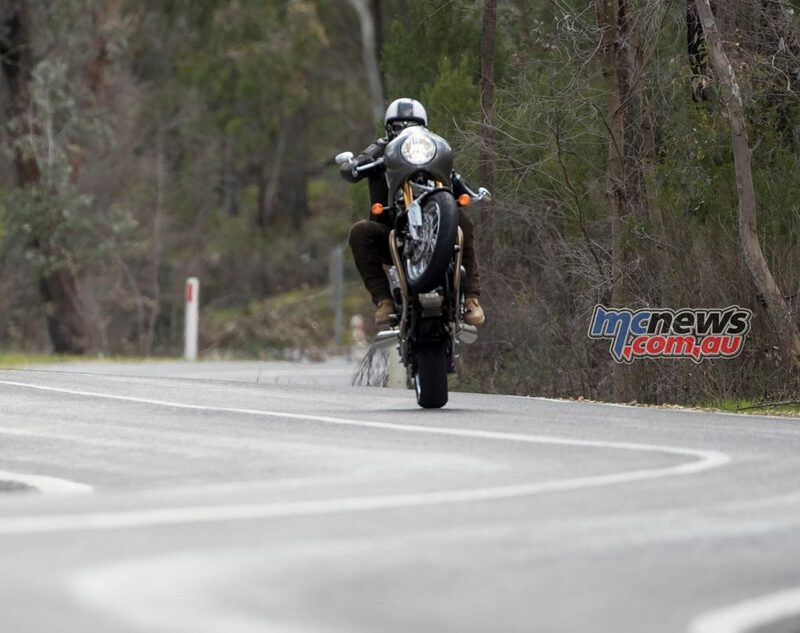 The Thruxton R scores fully adjustable suspension at both ends with Showa big piston forks and Ohlins rear shocks. 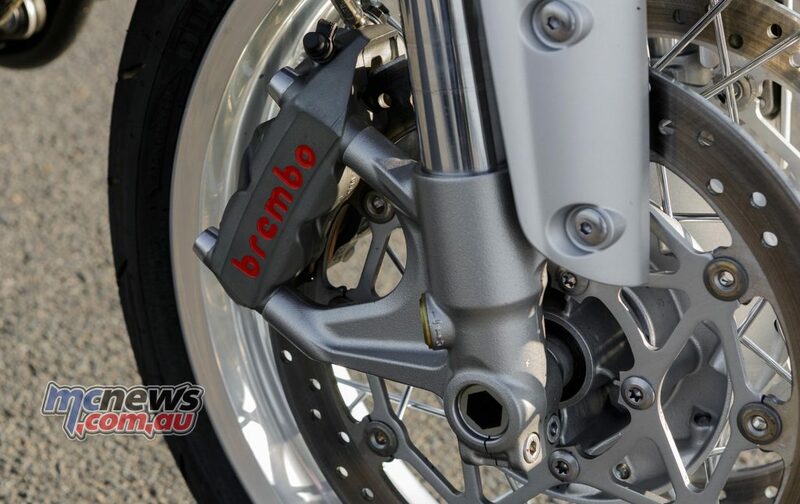 Better brakes also adorn the R model, with Brembo master cylinder and Monobloc calipers providing further purposeful bling while adding plenty of extra bite over the adequate, but fairly basic, Nissin two-piston setup on the standard bike. 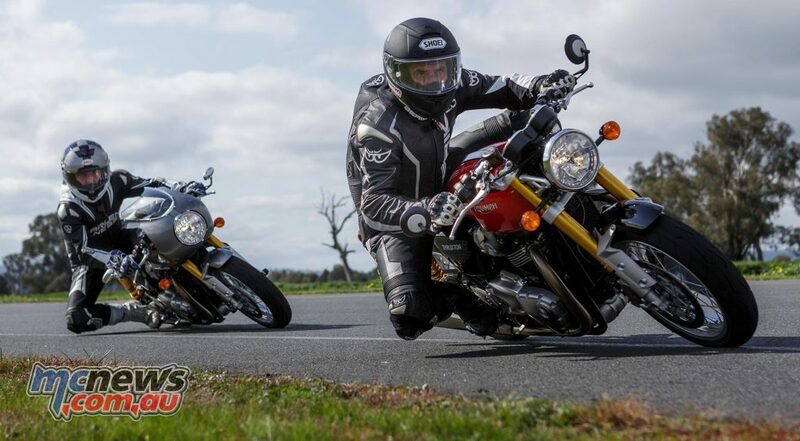 The grips are narrower and the pegs lose their rubber tops on the Thruxton R, but there is still no unpleasant vibrations felt either through the hands of the feet. The R shows off a brushed aluminium exhaust system while the base Thruxton wears chrome pipes, matching its old style fork-gaiters and more 60/70s period credentials. Stylistically, apart from the obvious touches of gold on the Ohlins shocks and Showa forks, the R sports a beautifully polished upper triple clamp and a metal strip longitudinally along the top of the tank, a silver anodised swingarm, slightly narrower bars and a marginally taller 810mm seat height, due to the longer Ohlins shocks. 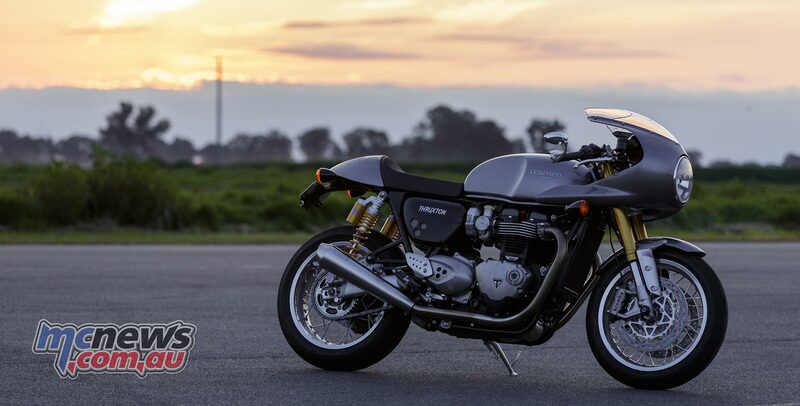 That is a hell of a lot for only $2400 extra over the base Thruxton, it’s a no brainer really. And don’t think that the higher spec’ suspension means a more uncomfortable ride, as the quality can be felt in the damping and there is plenty of scope for softening the response if you prefer a softer set-up. But, to be honest, then you might be better off saving yourself a significant amount of coin by choosing the T120…? Handling could be best described in a word as, solid. The bike is incredibly stable considering the quite aggressive geometry engineered into its tubular steel frame and relatively short wheelbase. 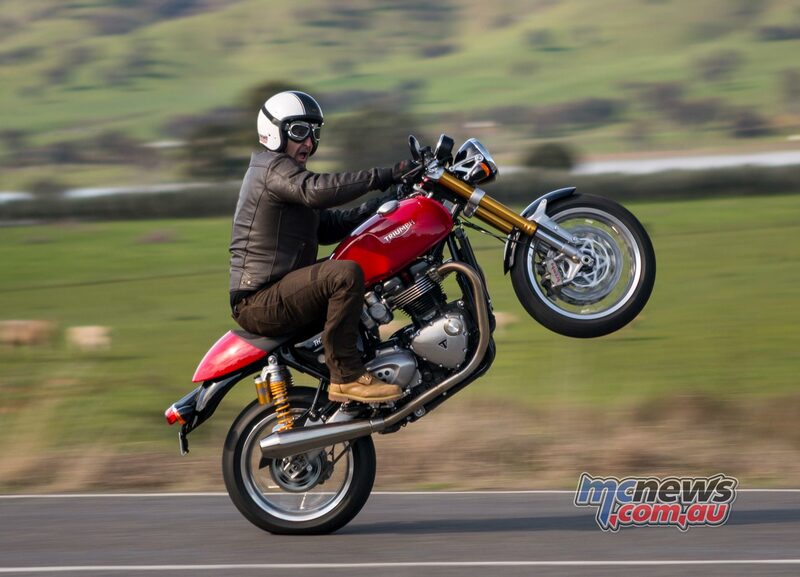 Those sensible tyre sizes certainly play their part in giving the Thruxton a light and fluid balance through turns that instils confidence, which translates to fun. The Thxuton R runs slightly more rake and trail than the base Thruxton and also runs much shorter gearing than its Pirelli Angel GT shod sibling. Mid corner bumps rarely upset the Thruxton as once set on course it just does the business and rounds the corner with minimum fuss. A combination of excellent suspension and sporty geometry does the business but somehow, from the bars, the Thruxton actually feels longer and lower than it actually is. The riding position must play some part in this equation also. Despite its nimbleness and agility through the bends, the Thruxton feels like a long, almost lazy bike. I can’t really work out why, and it makes my head hurt trying to figure it out. Again, that first word I used to describe the handling, ‘solid’, seems most apt. 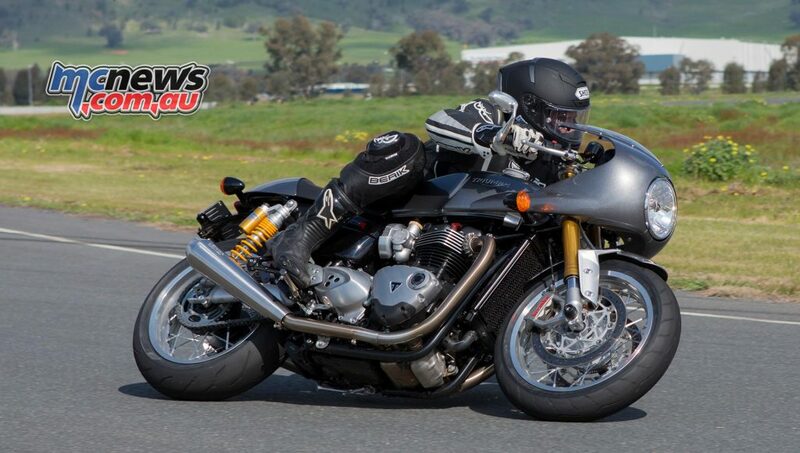 Curiously, Triumph decided to stick with tubed tyres for the Thruxton models. Presumably due to cost considerations with the production of tubeless spoked rims. Triumph have also endowed the Thruxton models with the full gamut of electronic safety aids. Switchable traction control, ABS and selectable rider modes all add a little more panache to the overall package while taking nothing away from the retro nature of the machine, or its essentially fun nature. Touring on the Thruxton certainly isn’t out of the question and the entire tank range can be used between stops without getting too uncomfortable. Since the launch I have done a couple of 500km days back to back with no real discomfort. 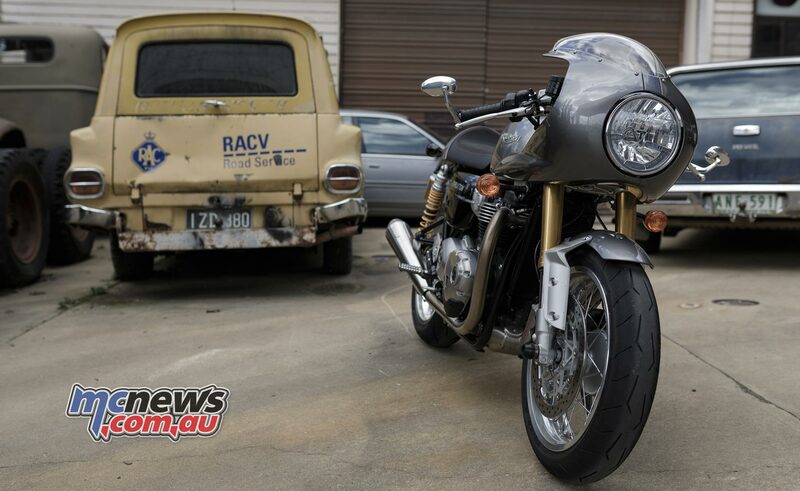 Even with the R’s solo seat cowl easily removed to uncover the same seat area as the regular Thruxton, both models still suffer a dearth of suitable tie-down points and any meaningful flat area to secure a roll-bag or the like. The best answers at the moment come by way of the genuine Triumph leather and wax cotton panniers. If you can get away with just one pannier Triumph will sell you a single item for half the $821 cost of the pair. The genuine matching tankbag retails for $277. There are some slightly cheaper nylon versions of both, but you just wouldn’t do it to the bike. 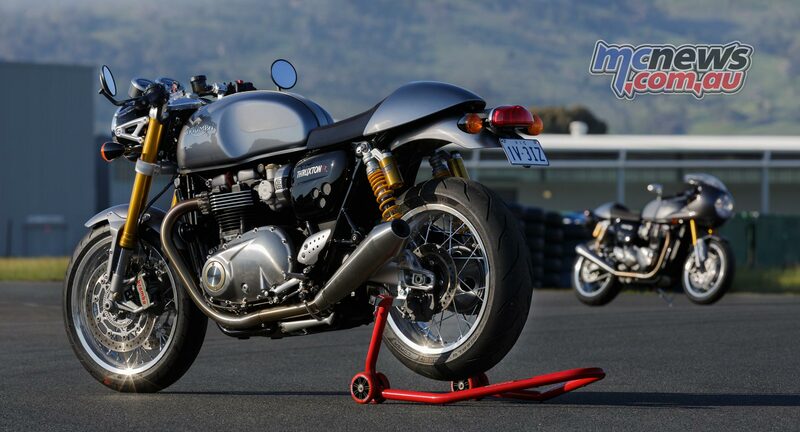 Neither Thruxton model can accommodate a pillion without the purchase of an optional dual seat and pillion pegs. I also prefer the seat of the Thruxton R, the surface of which is different to that of the regular Thruxton, upon which I found myself sliding around on a little. The only blight on the finish I could pick up is exactly the same issue I found with the T120. The surface on the Amal carburettor styled throttle bodies is prone to oxidisation. Oh, and while I am being picky, the sidestand is a pain in the arse to grab with your toe. For riders that prefer their sporting pleasures to unfold at speeds less than 160km/h (top whack is a little over 200km/h), I can’t think of a much more satisfying mount to be astride of, come the weekend. The fact that it looks absolutely bloody gorgeous is the clincher. 16,000km service intervals are a handy cost saver in the long run, although any merciful owner would swap the 3.4 litres of oil out themselves in half that time. 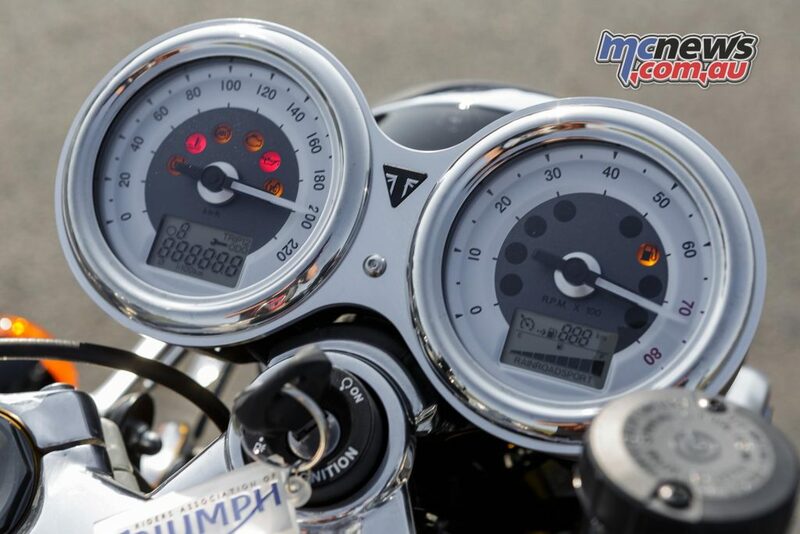 The instrumentation works well and is certainly one of the better designs Triumph have come up with of late. Functions can be cycled through from the switchgear and everything is well thought out. The standard USB socket is a useful touch. Overall the new Thuxton is a massive step forward over the last model in every area. Performance, styling and the quality of finish is seriously impressive.